This workshop lead by spiritual channel Alphedia of Elemental Beings focuses on teaching you about the Lemurian Seed Crystals. These crystals are very ancient and have recently been rediscovered by humanity now that we hold enough of an elevated consciousness to access the wisdom they contain. Alphedia will teach you what these crystals are, why they are a valuable spiritual tool to assist you on your divine path and how to access the knowledge within them. You will meditate with the crystals, receive healings from them and meet a Lemurian guide who wants to work with you at this time. Alphedia will receive live channelled instructions on the day as to the work to be done for the advancement of humanity with the crystals. There are three types of Lemurian Seed Crystals you will work with Clear, Golden and Pink. Different layers of knowledge is in the crystals which you can access when you are ready. They have horizonal striations across them which is how they are different to normal quartz.Each seed crystal comes with a Lemurian guide attached to it. The golden Lemurian Seed Crystals are rarer as they are fewer in number. They were created by the Lemurian High Council – the Priests and Priestesses. They hold the sacred wisdom that only a few incarnate can access the wisdom of at the moment. Many initiations have to be gone through by initiates to be granted the keys to access these crystals (golden seeds) wisdom. 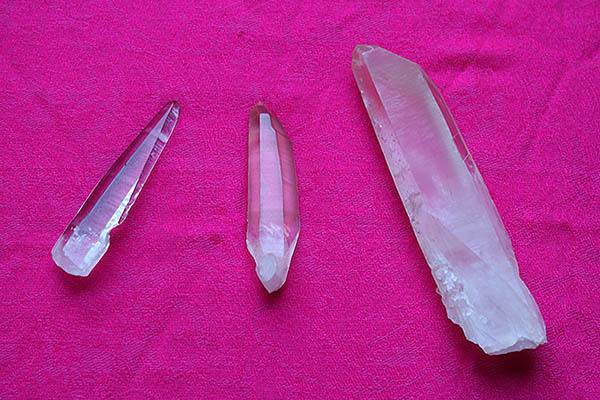 Pink Lemurian Seed Crystals are newer on to the market. The Seed Crystals are antennae for higher frequency light. They work on the light body (ka) of humans also known as your core energy matrix. Strengthening your ka connects you more to your Lemurian ancestry. No previous conscious knowledge of Lemuria is required or of working with crystals. If you are not yet a Lemurian Seed Crystal guardian Alphedia has a selection of them looking for homes. This is a lovely workshop working with the energies of these magnificent crystals which are a key tool on offer to light workers with Lemurian heritage. If you are drawn to this course there will be a reason – the Lemurian Seeds are calling you! Recording now available which includes worksheets and recordings of all of the course. It is emailed to you to listen to at anytime. Photographs of the seed crystals will be emailed to you so you can tune in via the photograph and also recognise the crystals.